Mr. Lawrence Orowe is the Vice Chairman of Kenya’s National Committee for the Prevention and Punishment of the Crime of Genocide, War Crimes, Crimes Against Humanity and All Forms of Discrimination. 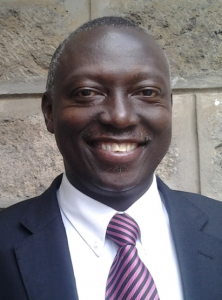 He formerly served as Group Legal Head of the Kenya Red Cross Society and also as a former Legal Advisor to the Department of Governance based at Kenya’s State House. Mr. Orowe specializes in a variety of topics including human rights law, international humanitarian law, and international criminal law, as well as civil-military coordination and peace and security issues. In addition to frequent participation in activities organized by AIPR’s Africa Programs, Mr. Orowe participated in the 2015 edition of the Global Raphael Lemkin Seminar for Genocide Prevention. Which actions, policies, and/or approaches do you feel are the most effective in the prevention of mass atrocities? I am continually struck by how genocide is ritualistic…. how it follows well-defined patterns. The details of the pattern may differ from one context to another but the essential mosaic remains. This genocide mosaic always includes the typology of distinction, the typology of hatred, and the typology of extermination. Genocide prevention needs to attack the root causes of genocide – the narrative of exclusion based on differences, the narrative of singularity instead of plurality, the narrative of one approach instead of multiple approaches. Genocide arises when, instead of wanting to enjoy the beauty of 100 different flowers blossoming in different ways, we seek to enjoy the limited beauty of seeing 1 flower blossoming in only 1 way. I think genocide reflects the narrowness of human thinking and behaviour. Life envisaged in terms of “Us” versus “Them” is not an escalation, but instead a limitation, of human possibility. I came into genocide prevention from both a human and a technical perspective. The human perspective, which is the one I care most deeply about, arose from years of humanitarian work that looks at the totality of the humanitarian experience of life and what human beings need to overcome life’s challenges. Within this human need set, food, water, shelter and air quality represent basic crutches of life while work, dignity, meaning, and purpose define and refine the human experience of existence. Conflict negates what life stands for; mass atrocity and genocide, even more so. The technical side of my entry into genocide prevention is the expression of the above principles into law, through international and local statutes, as well as human rights, which are capable of being enforced within a legal system. As a lawyer and a humanitarian worker, I initially joined Kenya’s National Committee for the Prevention of Genocide as a representative of the Kenyan Red Cross. Later, the Committee widened membership beyond the representation of a particular institution and, even after leaving Kenya Red Cross, I stayed on as a member. The work of genocide prevention fascinated me as I saw it as part of the fabric that sustains life itself. It seemed to me to be a cross-cutting peacebuilding endeavour for all peoples at all times across all societies. Could you tell us a bit about your work with the Kenya National Committee for the Prevention and Punishment of Genocide, War Crimes, Crimes Against Humanity and All Forms of Discrimination? What current projects are being carried out? Work at the Kenya National Committee is currently very election-focused. We are working on Multi-County and Multi-Communal Peace Forums in election hotspot areas around the country during the run up to the August 2017 General Elections. We are also advocating for a High Level National Dialogue, which would bring together political parties and citizens with a view to the development of a declaration shunning violence. We are also scaling up communication interventions and election material messaging focusing on rejecting political violence and embracing peaceful alternatives to electoral expression. In addition to this, we are starting to hold meetings with key national institutions that have a role to play in the 2017 elections. Our message is that elections shouldn’t be a zero-sum game. We are trying to communicate the message that a plurality of political thinking is a fruit of democracy and shouldn’t be sacrificed at the altar of narrow political expediency. We also emphasize that violence serves elitist interests at the expense of increasing the suffering of the common citizen. Our essential message is that elections should not kill, but instead should build. Could you tell us about the impact the recent Committee retreat to Rwanda had on you as you further the work of the KNC? What about your time at Auschwitz-Birkenau? Rwanda reflects the Olympics of Genocide. The killing of I million people in three months remains a sad genocidal record. However, meaningful learning must accompany this horrific event. One such course of learning is that a society can be restructured and re-engineered, during the post-genocide period, from total hopelessness and total calamity to meaningful and purposeful national cohesion and life. The case of Rwanda also reflects hope for the 12 countries of the Great Lakes Region in Africa, showing that cataclysmic genocide is not final and, more importantly, that learnings from Rwanda should and must be used to prevent other genocides. Auschwitz-Birkenau is, for me, a stark reminder of the rigorous methodology of genocide. It is also a clarion call of warning to all societies and all civilizations to recognise the systems and processes that always precede genocide and to prevent them in advance. My biggest heroes in prevention are ordinary people doing extraordinary things. I am most inspired by ordinary people who reject genocidal theory, go against the flow and, in the heat of the moment, do the right thing and seek to protect and save human life. There were many examples of such heroes in the Rwandan Genocide, and, even closer home, in Kenya’s recent Post Election Violence in 2007/8. Generally, I abhor the ideology of violence – the ideology of extermination in any society at any time. It is life negating.